Bertie is in Paris, a city which holds many attractions for him, not least the actress Sarah Bernhardt. It is the divine Sarah who informs him of a recent murder on the dance floor of the Moulin Rouge as the cabaret reached its climax. Bertie can never resist demonstrating his sleuthing skills and he rashly co-opts Bernhardt as his assistant. 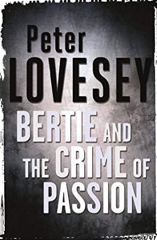 When the French police make an arrest, Bertie is on the point of quitting paris and abandoning the case. Prompted by Sarah, he discovers new clues and saves an innocent man from the guillotine.